Nortin Hadler, MD, has been doctoring for a long time. He’s old school. Loves a rich doctor-patient relationship, where the whole person – patient – is seen and comprehended. Treated in full. But these days, he says, doctors who care are burning out, retiring early, pulling their hair out. “Today,” he writes, “health is a commodity, disease is a product line and physicians are a sales force in the employ of a predatory enterprise.” Ok! This hour On Point, Dr. Nortin Hadler on how to heal American health care. The Greg Louganis story has returned to prime time, giving me the opportunity to remind my readers, and my students, that this is an example, of how not only do doctors care about their patients, but patients care about their doctor. In this case, the doctor was my beloved old boss, Dr. James Puffer. As the story goes, and some of you might remember, Greg Louganis hit his head during the Olympics of 1988, at which point, Dr. Puffer ran to stitch him up, enabling him to get back in the game and win a gold medal. Many years later he was quoted as saying that his biggest regret was that he did not tell Dr. Puffer that he was HIV positive. I tear up, as I think about this confession, as it speaks to the intensity of their relationship. Sure, the story has a happy ending. Dr. Puffer is HIV negative, and Greg Louganis is now 53 and seemingly enjoying his life. Yet, this story, even without it’s positive outcome, is a tale of connection, which I fear will be lost as medicine becomes more dependent on electronic devices. If a faceless doctor came to stitch him up, would Mr. Louganis have felt so bad? I do not think so. I think modern medicine has made it such that both physicians and patients believe that “buyer beware,” which in this case the buyer is the physician. This bond, where the patient cares about his physician, leading to the patient taking better care of himself, seems to me, is slipping away, as we, as a society, become more dependent on machines to evaluate our symptoms. The joke, on medical teams, is that the doctor will not believe the patient’s leg is amputated until he sees the X-ray. I am compelled to remind my readers that I love technology and I am excited about how modern science is rapidly changing how we track people and disease states. The complex area of following patients over time is much simpler with machines which contain the notes about the last visit and the last time the medication was changed. However, if these tracking systems are valued over the personal connection between the doctor and the patient, then I fear that medicine will be less fun for doctors, and patients will lose incentive to take care of themselves. The human touch, remains in my mind, a vital force for promoting wellness. In the case of Greg Louganis, that human touch, could have had fatal consequences for Dr. Puffer, but luckily, instead, it brought to light, the humanity between patient and doctor. The Doctor/Patient Relationship: Why Care? I am not so sure. As I think about Hippocrates famous quote, I want to argue with him, as being too simplistic. When it comes to hypertension, diabetes or depression, I completely agree that understanding the person with the disease is more critical than understanding the disease, by itself. However, if this same person had a rare blood cancer, then the first order of business is to understand the disease, treat the disease and then, or at the same time, try to understand how this rare disease impacts this particular person. As a patient, my first priority is to become disease-free, and then my second priority is to have a doctor who understands what my disease put me through. Ideally, the treating physician is the same person as the understanding physician, but with the change in health care, this is likely to be two different people, and the latter is not likely to be a physician. Hence the main therapeutic relationship is likely to be with a non-MD, and on the face of things, I think that is fine for most situations. What I moan about is the rare event where it is critical to have a doctor who is both diagnostically sophisticated and deeply compassionate. For prolonged illnesses, such as those dealing with heart transplants, it is helpful if the physician is both sophisticated with the nuances of anti-rejection drugs, while at the same time, understanding of how this transplant has significantly altered this patient’s daily life. Most of us, though, do not have rare illnesses (redundant, I know), and hence most of us need someone to remind us of how to take care of ourselves, while another caring soul can help us integrate our medical problems into a new understanding of ourselves. 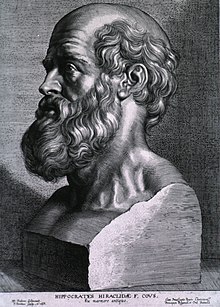 So, my response to Hippocrates-“it depends”. Should doctors dispense their own medications? Why do we need pharmacies? Many optometrists also sell glasses, so why should a doctor not give out the medication that he/she prescribes? This question has baffled me for years. As a psychiatrist, I fantasize about the possibility of giving medication on the spot, avoiding the second step of what many of my patients call the “shame” of having to go to a pharmacy, with the often-felt look of dismay on the dispenser’s face, as my patient picks up his third psychotropic medication because the first two did not work. As the LA Times series, mentioned above, illustrates, pharmacies, as the middle-men, are subject to miscommunication and possibly fraudulent behavior. If doctors dispensed medication, the patient paid the physician, then the physician gave the patient a receipt, allowing the patient to get reimbursement. This reimbursement would be done at the same time the patient is reimbursed for the office visit. Simplicity and efficiency would prevail. Fewer mistakes, as it would be unlikely for me as a physician to dispense the wrong medication to my patient. Costs are less because I would bear the overhead expense of storing and tracking the medication. The intimacy of my relationship with my patients would benefit, as adding a third player into our relationship often feels intrusive and unnecessary. Rarely, pharmacists answer important questions for my patients, but for those situations, I would hope that there are pharmacists, on call, for a fee, that are available to explore medication inquiries, including drug interactions. There-health care in the next century-maybe if the folks in Washington consulted me-real progress could be made. Whose ear do I need? At the risk of sounding like an old fart, I am not prepared to accept the changing nature of psychiatry, yet again! For many years, I have appreciated the advancement in technology leading to Tele-Psychiatry, where people who cannot leave their homes, or who live far away, can connect remotely to a psychiatrist, allowing for access which would otherwise be impossible. For adult patients, I am excited by expansion of our services. Now, let’s move into Child Psychiatry. Can a Child Psychiatrist do an assessment through a computer screen? It seems to me that evaluating children, working with families, mandates a three-dimensional exposure which would be severely limited by Tele-Psychiatry. As so much interaction is non-verbal, and as so much of an assessment includes “playing” with the child, I do not see how remote communication can simulate this encounter. Two-way communication devices are wonderful advances in medical settings where doctors do not need to touch their patients, but as a Child Psychiatrist, the “touching,” or more specifically, the shared use of space is critical to understanding how a child navigates their world. Some kids come and sit quietly, whereas other kids have a hard time staying still. Sometimes my words help kids focus, whereas other times, a child needs to be active in my office. These nuances will be lost with a remote access device. Once again, I am left thinking that change can be good, but then again, not always. I understand the dilemma between improving access and quality assessments. I also understand that as a field Psychiatry, particularly, Child Psychiatry, has to hold on to the key tenets of the profession. For me, this includes being in the physical presence of a family is an important component to the understanding of powerful relationships and their sequelae. I am not sure I would be willing to compromise on that issue. Technology should aid us in our goals, not detract us from them. Tele-Psychiatry for kids seems to move my field in the wrong direction. 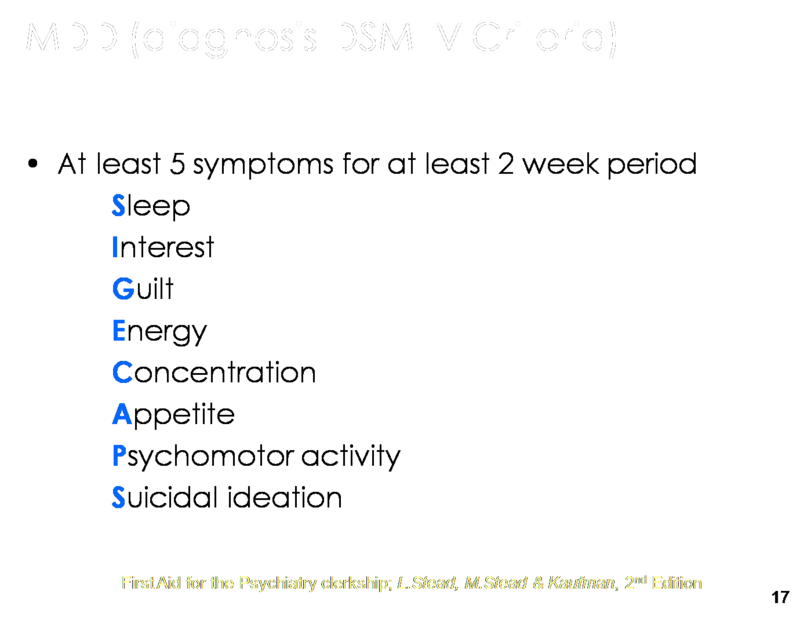 This is the mnemonic for diagnosing depression, according to our current manual, DSM-IV. Five symptoms, two weeks, seriously? Let’s review. Suicidal thoughts, are these active or passive? Perhaps they are related to a traumatic event. What if they go away in three weeks, then does the person still get a diagnosis of “Major Depression”. Interest in activities, is this losing interest or diminished interest? What if the person is fatigued, as a result of anemia, and this explains the lack of interest in activities? Guilt, my favorite criteria, since so much of guilt is unconscious, are we talking about conscious guilt? If so, very few people admit to this, particularly not int he first interview. Energy, see my comment on interest. Concentration, again, see my comment on interest. Appetite, decreased I can understand is a sign of mental dis-ease, but increased appetite is often a result of increased energy expenditure. Psychomotor changes, maybe a result of fatigue, or boredom, not necessarily depression. Sleep, same as appetite, in that it is often dependent on activity level. So, am I dismissing our current diagnostic system? Yes and no. Symptoms must be taken in context. Context is understood through building a relationship where the patient increases trust, and therefore feels more free to display the context of his/her symptoms. A rush to judgment leads to a rush to medicate, leads to a patient not understanding his/her own mind. 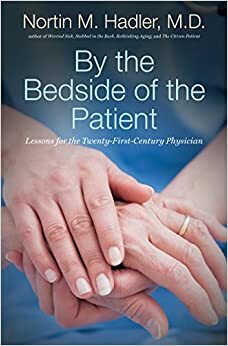 A delay in judgment could lead to needless suffering, but I would argue that the relationship building helps the suffering, so while I obtain a thorough history, I am also helping the patient symptomatically by providing a space for thought and reflection. I want the patient’s history to become relevant again in psychiatry. This is a major reason I have this blog. I will repeat this point until my field changes its emphasis, or until I retire. I hope for the former. Are psychiatrists going concierge? Wait, I am confused. I understand that certain primary care physicians charge patients an annual fee to be on their patient panel. In exchange for this annual fee, the patient is given more personalized service including easy access to their physician, house calls and sometimes the physician goes with the patient to their specialist. This means that the primary care physician goes from a panel of patients in the thousands to a number which is less than one hundred. The ethical dilemma is who is going to take care of the patients who are no longer seen by primary care doctors who change their practice. There is a primary care physician shortage, but whose job is it to fill in that gap? Is that the doctor’s responsibility? I recognize the dilemma both for patients and for physicians over this trend to pay for more personalized service. Now, let’s add-on. Are psychiatrists now charging patients a retainer to be on their panel? Does this make sense? Maybe. Maybe not. Fees are interesting therapeutic issues. When people pay do they value the service more? Sometimes. On the other hand, paying for service could make them value it less, as some people see financial exchange for immediate service as a right, without an appreciation for the effort that goes in to accommodating other people. There are a limited number of hours in a day, so one has to limit the time or limit the patients somehow. What is the fairest way to do this? Maybe fair is not relevant here. Maybe this is a personal choice, where physicians choose how they practice and patients choose what makes sense for them. On the other hand, maybe there should be public service requirements of physicians, where they have to spend some time serving a low income population in order to maintain their license? Maybe The Medical Board should require physicians to teach in medical schools as a way to spread their knowledge and experience. I have no answers-just questions. Teaching Primary Care Residents, I learn so much. I also get frustrated, angry, and fantasize about going on the rooftops to let others know of my unhappiness. “Sometimes, when a patient comes in the hospital, and we are not sure what is going on, we stop the SSRIs and all the nonessential medications to see what is going on with the patient,” an excellent, smart, hard-working resident says to me. “Who says the SSRI is nonessential?” I ask, thinking that no one is checking in with the patient to see if he feels their SSRI is “nonessential”. “Well, you know, it is not life and death,” he says, understanding my discontent. “No, it is usually not life or death, but it is quality of life, and this can determine if the patient is motivated to help himself get better,” I say, knowing that the resident does not need an education about the importance of SSRIs, but that he is reflecting back to me the feelings of the team-the medicine team, composed of interns, residents and attendings. “I am sorry,” I say, “but I think that behavior suggests a dismissiveness to mental health. I think that the team is believing that SSRIs are relatively trivial medications and so they can be stopped, similar to vitamins.” He agrees, but looks at me with some sense of regret for bringing this to my attention because he can see my upset. I wonder how to push through this arrogance, sometimes seen in primary care, where they believe that physical health trumps mental health, every time, as if they are not closely linked. Medicine, as a field, has a lot of room for growth. Openness, as with all growth, has to be the first step. For now, I am stuck.